And now, in this heat, I gotta wear black! Squatting for hours and hours behind the plate! Never mind. If I could never play baseball even though I love the game, at least I can umpire, and I love doing that. All in all, the players are worse off, in full uniform, in the hot sun, running from base to base and catching balls. Being an umpire—“ampaya” as we say here in Cuba—has its good side and its bad side, one of which is that it can be good and bad at the same time. We’re the guys who have the final word, especially the umpire-in-chief, like me. Sometimes I get jealous of volleyball refs: cool, wearing white and…sitting down at a height where they can see everything clearly and be out of the range of players and coaches. Soccer refs also get to wear shorts but they run around just like the players and you really have to know your stuff to call a corner or call a strike.” And in boxing, don’t get me started. These refs are decked out in dress shirts and ties. OK, they’re pretty close to the action but I’ve never seen any one of them KOed. Lately women are getting a chance to be umps and refs, in sports that have always been the domain of males. If we don’t wake up, we could even end up without a job, because with ladies present things cool down. And now the spectators are starting that cat-calling and whistling thing. They see us as the “enemy.” I’d like to see what the game would be like without us; even when we’re there it practically becomes a jungle. Imagine what would happen if home runs got to be decided by the coaches. We’d have to have an ICU next to the baseball stadium. This pitcher is screwed. All he does is float balls and they hit them out of the ball park. Damn! I jinxed him. It’s a heck of a triple play. What is Víctor Mesa waiting for to get rid of him? That’s a guy who changes pitchers more often than his handkerchief and he’s turning a blind eye. This is never going to end! Now he’s throwing balls too close to the batters. Let me warn him because if one of the batters gets hit, something nasty is going to happen. Yeah, I called a strike. Let the spectators heckle me all they want. 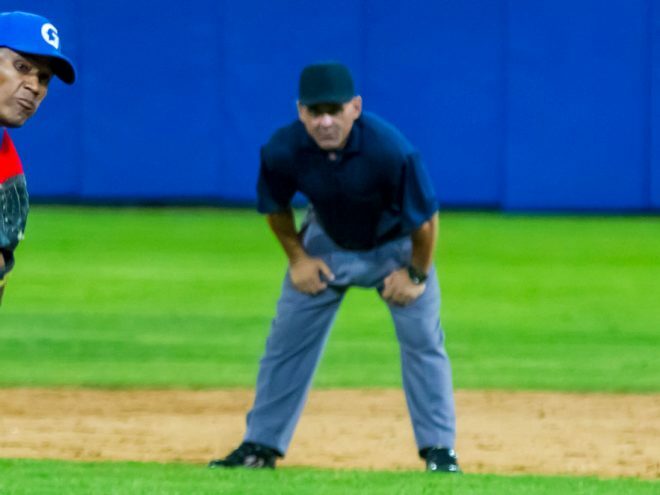 This Latin American Stadium has more umpires per square centimeter than anywhere else in the world. And the batter is going to challenge my call? People don’t know the rules around here, or they forget them whenever it’s convenient. And what’s this pitcher doing, coming up to side with me? And first base should know it’s none of his business? And Vargas too. I’m gonna ask for red cards to be used in baseball. The first clown who kicks up a fuss…he’s out of the game. Whew, luckily, things didn’t get ugly. My back is already killing me. Thank God the two pitchers have a good handle on it and the game is going well. Great hit! For sure, those Industriales are artistes when the spirit takes them. The guy on first is trying to steal a base. And the second base ump is ignoring him. If it’s a close move, he’s gonna have a hard time and it’ll be up to me to make a decision. That’s why I’m here facing the field…and the lights, which are really bothersome. Every day my wife asks me when I’m going to retire from all this. I can tell that she’s never really liked baseball. Did I say baseball? She doesn’t like any sport, only rhythmic gymnastics with all those hoops and ribbons. What if I had been a gymnastics judge ? No way. I’m a baseball kinda guy. All that nonsense about points, apparatus, composition and execution and arguing with some lady smelling of Chanel No. 5… No way, Jose. I don’t like watching rom the sidelines. Equestrian sports, swimming… Not on your life. I need to be on the inside of things, on the field, sweating, close to the catcher, making both spectators and players hold their breath whenever I call ball or safe. Out at home! The kid has some arm! If he keeps on playing like that he’ll be the best pitcher in Cuba. And he was right on; so much right on that no one said a word. And in the bleachers nobody argued because that was the favorite team. If it had gone the other way, the roar would have been deafening. You would’ve been able to hear them in Camagüey. Finally it all ended: nobody thrown out, not too many claims. I wish it was always like that. Our “Blues” really played well but I still prefer the team from Granma, but don’t tell anyone. With all the baseball fanatics out there, who would ever believe that I will not take sides with my favorite team? They don’t understand that when you’re on the field, it’s just like being the judge at a trial. There’s my kid yelling at me. Ever since that time when I forgot he was there and went home alone, as soon as the game ends he starts calling out to me. He doesn’t know that after his mom’s scolding, I’ll first lose my head than leave him behind! Let’s go buddy. Tomorrow’s another day…and another game.